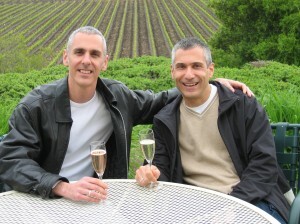 Tom and his husband, Cy, at Gloria Ferrer. “Considering the geographic proximity, it’s simply ridiculous that I can’t ship wine to Maryland,” reasoned Tom Natan, the owner of Washington DC-based First Vine Wine Imports + Sales, as we sat down over coffee to discuss the real-life impact of Maryland’s anti-consumer wine laws. Maryland’s oenophiles would probably agree. First Vine imports an array of wines from France, Spain, and even Malta. For most of these wines, First Vine is the only importer in the United States. And all the wine is affordable — most bottles range in price from $10 to $35. Yet consumers in Maryland (and most other states) are legally prohibited from purchasing wine from First Vine and other out-of-state retailers. Such laws stifle consumer choice and keep prices artificially high. On one trip to Mexico, he met an environmental consultant who lived on a vineyard in France. He had always loved wine, so asked for more details – and soon learned that this woman’s husband grew grapes in Provence, co-owned the village wine cooperative, led wine tastings for English-speaking tourists, and helped represent a number of small wine producers. 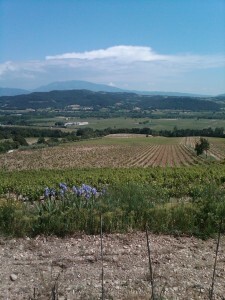 A view from the middle of the ridge in Vinsobres, France, looking south toward Mont Ventoux. Vinsobres is the village First Vine first imported wine from. Over a few visits to Provence, Tom fell in love the cooperative’s wines. They weren’t available in the United States, so Tom thought he could start a business importing those wines. He was right. Washington DC is one of the only places in the country that allows retailers to import wines directly from overseas producers, so in 2007 — after hiring a liquor attorney, securing a few licenses, and paying several fees — Tom jumped in. It’s been his full-time job since 2008. Today, First Vine sells about 50 cases of wine each month. In Washington DC, First Vine’s products aren’t that hard to find. Interested customers can check out the company’s blog and/or Facebook page, where Tom alerts people to upcoming events. About twice each month, First Vine’s wines are poured at places like Hill’s Kitchen, a gourmet kitchenware store, GoodWood, a quirky furniture boutique, or Alliance Française. Tom can’t sell at these tastings, but he can direct people to his website. Tom is also the main wine supplier to many large events, as DC law requires caterers to purchase from a retailer. First Vine was also the only retailer at this year’s International Wine & Food Festival. As one might guess, many of the folks who taste these wines – and then inquire about purchasing them – live in Maryland. The Maryland/DC border, after all, is just four miles from where First Vine stores its wine. Of course, Maryland residents can skirt the law by using a DC office as their delivery address. Many undoubtedly do. “If lawmakers are so concerned about Maryland residents ordering wine, perhaps the state police should set up stings at the border crossings,” Tom joked. His larger point was convincing, though. Who, exactly, are Maryland lawmakers protecting? First Vine carries a unique selection of wines not available anywhere else. The wines are affordable, too — because First Vine is an importer and a retailer, there’s no distributor taking a cut. Plus, Tom, his husband Cy, and their business partner, Dare Wenzler, are extremely knowledgeable about the wines they carry. So they can help customers find exactly what they’re looking for. 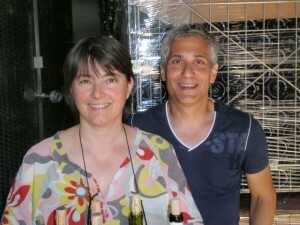 Tom with Valérie Chaume-Arnaud, one of the producers in Vinsobres whose wine he imports. Many Maryland lawmakers, like House Economic Matters Committee chairman Dereck Davis, maintain that out-of-state retailers like First Vine would threaten the livelihood of local liquor store owners “during the worst economic recession in modern times” if allowed to ship into the state. In Tom’s opinion, this is nonsense. “I don’t pose a threat to any Maryland retailers,” Tom argued. “Most liquor shops rely on walk-in business – think of the corner store where people stop on their way home from work to pick up a bottle of wine to have with dinner. I pose no threat to those stores. “The larger wine shops aren’t carrying the same labels I am, because the producers I import can’t afford to deal with our country’s three-tier system,” Tom continued. “It isn’t possible for any wine store to carry everything. And then there are all the ways Maryland could benefit. First Vine does ship to Virginia, collecting both sales and excise taxes for the state. Plus, First Vine had to purchase a $160 “shipper’s license” from the state. “Why doesn’t Maryland see this as a revenue generator?” Tom wondered. The answer, of course, is the power and influence of Maryland’s well-heeled special interest groups, who see larger legal and strategic issues at play with the efforts to liberalize Maryland’s liquor market. Such protectionist laws, though, are anti-consumer and anti-choice – and must be reformed. They used to. In fact they used to stake out DC liquor stores until the DC government realized there was no reason to allow them and kicked them out. The Washington Post, in the 1980′s, ran into a Supreme Court Justice who lived in Maryland loading several cases of alcohol into his trunk in front of a DC store. When asked about being stopped by MD police he said, “let them”.